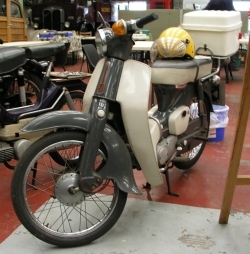 Launched in 1958 as the Supercub, the Stepthru has been one of Honda's mainstay models which has been developed over the years. Whilst still retaining its original looks, the Honda was initially available in three engine sizes of 50cc, 70cc and 90cc. Up to 1992 Honda had sold over 20 million Stepthru's and although still in production after 42 years, only the 90cc engine is now available. July 2000 - This has been given a very thorough clean and inspection. October 2000 - Work continues to get this moped in running condition once again. July 2003 - More work on this now has it running very sweetly indeed.